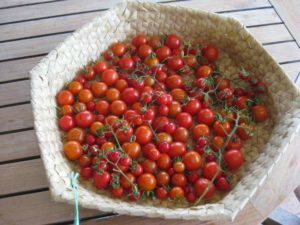 You don’t need a large garden to feed yourself – you just have to start! Beautiful crop of dwarf Cavendish banana harvested a month ago. It took three of us to cut this bunch down and move them to hang undercover and ripen – it must have weighed over 30 kg. Everyone has said they are the most delicious bananas they have ever eaten – yellow and creamy flesh. Bananas are very easy to grow and don’t take a lot of space. WHAT TO HARVEST AND WHAT TO PLANT IN YOUR WINTER GARDEN? I wasn’t thinking of taking my wheelbarrow any further than the end of the garden today so I was a bit perplexed this morning when I noticed this warning sticker on its tyre ‘not to be used on the highway’ – I only wanted to move some compost! A little later on Jo stopped me on my way into town and asked “can I still plant onions – is it too late”? I don’t know what your normal conversations are, but mine invariably go something like this. It seems like a simple question but it is really quite a big one – what can I plant and when? 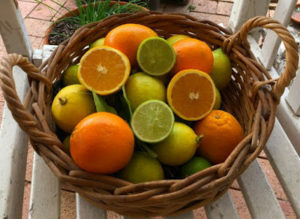 This would be the topic that, over the years, I have probably been asked the most – apart from questions about citrus. 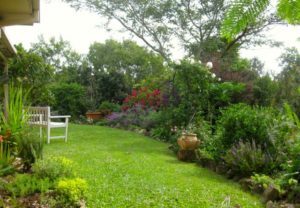 When answering this, the most important factor that you have to take into account is your climatic region (the big picture) and then the micro climate of your garden (the little picture) – where are the hot bits, windy spots, shady parts etc.? In other words, have a good look around, understand your garden and – TREAT EACH SITE ON ITS MERITS. To give you an example. Our region is classified as sub-tropical, and I have certainly had to totally rethink the question “what can I plant and when” since moving from the temperate (cooler) climate of Sydney. Here in northern NSW my most productive time in the kitchen garden is from autumn through to late spring (right now) – whereas in Sydney it was through summer – the total opposite. Harvesting Now. 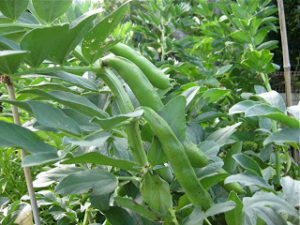 Broad beans are easy to grow around here – plant seeds 30cm apart in late summer. Like sweetcorn, they like to be planted in one patch with each other and not mixed up with a lot of other plants – unlike the rest of the food garden that thrives on diversity. WHY, because corn and broad beans happily cross-pollinate between themselves and, being tall, use their brother and sister plants for support – so plant them in a group. And while we are talking about micro-climates – I will give you an example; I can’t get garlic to ‘head’ (form up into cloves) in my garden and use it as ‘wet garlic’ (like a fat spring onion) in cooking – yet 5 km up the valley they grow beautiful stuff – because it’s a few degrees cooler than here. Conversely, none of the valley folk have any ripe tomatoes or zucchini yet, but my neighbour and I are harvesting already – because it is warmer. Here goes! Below is a list of all the food plants in my garden at the moment – divided into ANNUALS (I have to plant them almost every year) and PERENNIALS (they just keep going). If you have realised that it’s good to have a mixture of both because you will always have food – you are half way there. Pick a curry, any curry! 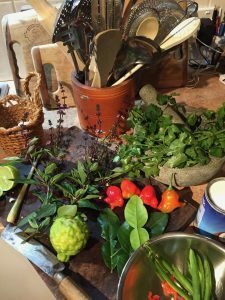 For all of you who love to cook and eat spicy Asian food there is an added bonus to living in the sub-tropics for you can grow just about every required ingredient – from turmeric, ginger and galangal to curry leaf, kaffir lime and lemon grass. Nothing puts a zing in your mouth more than fresh ingredients in a curry or stir fry. 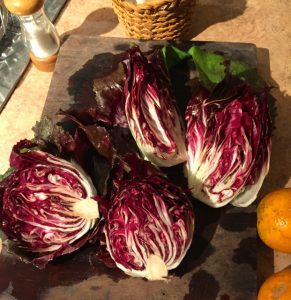 Radicchio. A fantastic winter salad plant for the sub tropics. 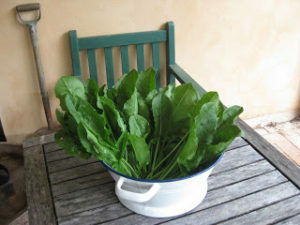 Easy to grow and a wonderful bitter green in the Italian tradition – good for the gut. I grill it, after brushing it with olive oil, balsamic vinegar and garlic – which increases its sweetness and takes away some of the bitterness – the edges go a little golden and crunchy and its delicious with fish. 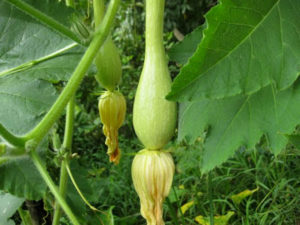 Climbing trombone zucchini – seeds saved from last year and going in soon. All of those plants in the lists above have been planted within the last five years and a most of it virtually looks after itself, with a lot of the annuals self seeding. I JUST HAVE TO LOOK AFTER THE SOIL. 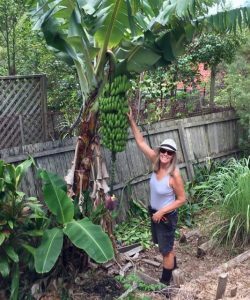 I live on a small suburban block – less than 800 square metres – with over fifty food plants scattered throughout the garden. AND, IT’S THE WAY THAT NATURE IS – SOME SEASONS ARE BETTER THAN OTHERS – no two years are ever the same – that is part of the fun of gardening – surprise!! The most important lesson I have learned is that the annual food plants in the sub-tropics do best in the cooler months of autumn, winter and spring and deteriorate rapidly when the rains and heat come over summer. However, for most of the year the garden is incredibly abundant and always gives us something to eat. So, to answer Jo’s question – if you want to plant onions, do it now and you might get be able to harvest them before the rains come. Give it a go. Just see how much you can grow! Sorrel, an abundant perennial salad in the sub tropical garden – with a tangy lemon flavour. Great added to salads; as a stuffing for fish, a winter soup with parsnips and potatoes or great in a tart with goats cheese.